Sometimes it is really hard to convince yourself to eat breakfast in the morning but you have to because it really is the most important meal of the day. Your body uses food–primarily carbohydrates (this is your body’s favorite food to fuel source)–as it’s go to source for energy. It’s important to eat a healthy, balanced diet to not only keep your metabolism going but to also keep your brain functioning on early mornings. I know some people skip meals in order to reduce their calorie intake because they think that this will help them burn stored fat–well, unfortunately the body doesn’t quite work that way. Skipping meals is actually bad for your metabolism. The body gets tricked into preservation mode when you don’t eat enough calories/a balanced diet. What does preservation mode mean? It means that your body is actually tricked into storing fat/won’t give up fat because it thinks that there are impending bad times ahead–you can thank evolution for this phenomena. When food used to be scare, our bodies would store and hold onto as much fat as possible–think of it as your bodies very own rainy day fund. This is what really happens in the body. What this all means? If you don’t ingest enough protein and carbs, your body will actually start munching on its own muscles for fuel. Not good! Extreme athletes that push themselves to extreme limits will use protein as a source of energy after all other stores are depleted–but they also know how to replenish protein quickly so it doesn’t do damage to their bodies. The average person–who say is walking to work–shouldn’t be using protein as a source of energy at all. That’s why it is important to eat a diet that has both protein and healthy carbs. One of my favorite college professors always used to tell us “Carbohydrate ingestion–spares protein breakdown”–as you can tell she was anti the extreme low carb diets. So what she was saying is that if you eat enough complex carbohydrates–your body will never go into that preservation mode & burn your muscle tissue. What it is really all about is feeding your body the right kind of carbs–complex carbs, in place of insulin spiking simple carbs. 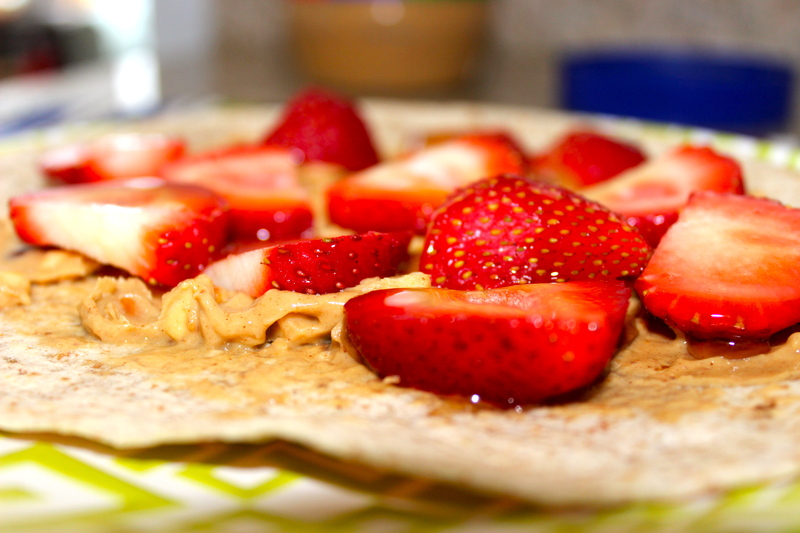 My strawberry peanut butter wraps offer a great source of protein and complex carbs with a side of antioxidants & vitamin C from the strawberries. 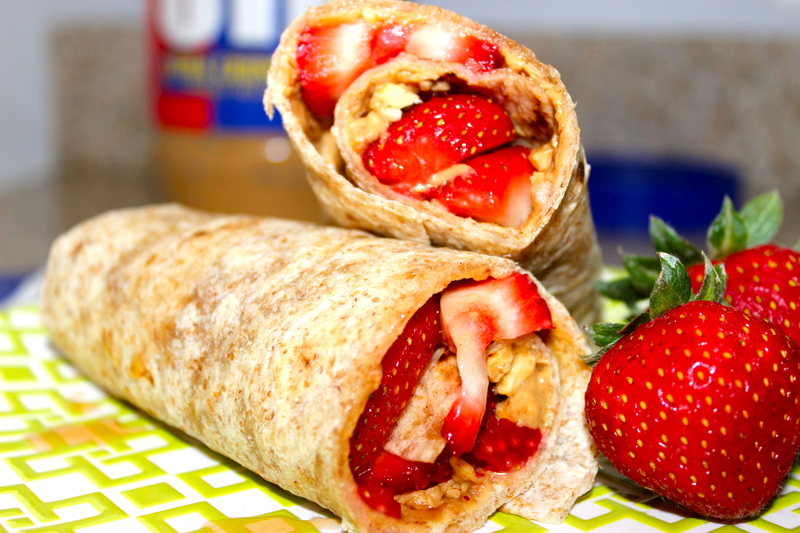 It is a great on the go snack/breakfast–just wrap it in aluminum foil and eat it burrito style on the go. Couldn’t be more simple or tasty. Drizzle with your favorite sweetener: honey or agave–I use Raw Agave because it has a lower glycemic index than honey and doesn’t cause your blood sugar to spike. It’s also sweeter than sugar so you don’t need to use as much. I hope you enjoy this easy breakfast/snack. It is packed with protein and is a great source of complex carbs. Plus it is relatively low in calories and is sure to keep you feeling full for awhile. Bonus. It’s one of my favorites and definitely breaks up the greek yogurt breakfast monotony…and it’s a lot easier to eat while you walk. Beautiful and healthy! I love it!! Yum! I think my kids would love this recipe for lunch! Thanks! I used to work as a full time nanny, and my kiddo loved them! They are a big hit for all ages:) thanks for stopping in! Thanks for stopping by! Hope they enjoy it! I’ve done this with bananas, but never strawberries. I’ll have to give it a try! Definitely a fly out the door food. Thanks for the recipe. Again, your photos are a great part of the post. The nutrition piece was easy to read. Enjoy your SITS Day. Thank you! My professors would be happy to hear that the info was clear and concise! Thanks for stopping in! These look soooo good! I must try these at home! I hope you will! They’re addictive and healthy for you! I love these. Super easy to make and delish! Happy SITs day! Thanks for stopping in Elisabeth! This is perfect! I’ll have to share this with my daughter! Visiting from SITS, enjoy your day! Thank you so much! Hope you both enjoy! Now I want some strawberries… can’t wait for summer! Yes please! I can’t wait…the winter has lasted long enough. It’s definitely a taste of summer! Hope you stop back in soon for the recipe! These look SO good! I love peanut butter on anything, so I’ll definitely have to try this! I usually do a wrap with bananas, peanut butter and honey. Happy SITS Day! I love your blog and I can’t wait to follow it! Thank you! I look forward to checking out your blog as well! Looks great! I bet my kiddos would love this in their lunchboxes! Thanks!! I hope you give it a shot! Thanks for stopping in! Okay, I have to admit that I never would have thought to put all of those ingredients together…but it looks fantastic! My kids would probably really like it too. Happy belated SITS day to you! Thanks for stopping in! I hope you give it a try…it’s so delicious! Ahh, this looks so good. SOOOOOO good. It’s so simple and delicious! The best combo! Read this and within minutes I was eating it. Super delicious and very easy to make. one of my favorites! glad you enjoyed it!